Yha Mei Ho House Youth Hostel is recently renovated and located in the centre of Kowloon. 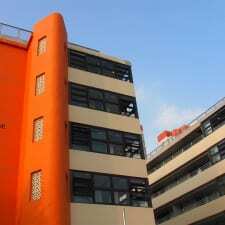 It is a five-minute walk from Sham Shui Po Mass Transit Railway. Rooms at Yha Mei Ho House Youth Hostel are air-conditioned with en-suite shower. They can accommodate two, three or four persons. Bed linen, towels and breakfast are included in the tariff. Some rooms also include a kettle, TV and hairdryer. Lockers are available. Communal services include a games room, garden and lift with disabled access. Additional features include a self-catering kitchen, free Wi-Fi and free computer use. There is a shop, plus luggage storage and facilities for laundry and conferences. The ground floor café serves breakfast choices. The numerous nearby restaurants include Aqua and Ming Court. Vango Convenience and Sunshine Laundry are among the equally numerous convenience stores. The centre of the city's market, shopping mall and supermarkets, are all 500 or so yards away from the property. Members of staff are very efficient and are more than happy to sort out any queries or problems. They speak English, Chinese and Cantonese. For your added confidence, there’s 24 hour security here. There are a number of aspects here that lead you to think that you are in a hotel, rather than a hostel. Leave out the ‘s’ from 'hostel' and you are probably nearer the mark! Everything is clean and modern and the place appears to run like clockwork. The bus stop is nearby and the MTR, five minutes away, gives easy and cheap access to all areas. This isn’t, though, a tourist area so - *big bonus! – restaurants etc; are a good deal cheaper than you might otherwise expect. Five minutes after eating a Chinese meal, the Western digestive system says that it’s hungry again. That applies to breakfast here. OK for some, but for many travellers, it’s hardly worth the bother and the stomach soon starts rumbling again. Later meals are also served and are more substantial. The cost that’s attached to use of the washer and dryer is very high. This leaves a not sweet, but quite a sour, taste in the mouth. In truth, the place is more like a budget hotel than a hostel so, overall, a decision to stay here is still a wise one, economically. Check in is very late and depending on your flight arrival time, it can mean that most of that day is wasted. Having thought of so much, it seems strange that they don’t supply bottled water. Neither is there a TV in the common room.